Do you know Caroline? I guess YES, because she was my guest on Tuesday, when she shared part of her life with us by answering some questions about her lifestyle. She’s still sitting next to me – Welcome back, Carol! Nice to have you here, again – so let’s lose no time! I’m highly interested in your answers! Can we start? Here’s your coffee… ☕ Yes? Ready? Let’s play! ▷ I’ll cross that bridge when I come to it. ▷ Do what you love, love what you do and believe in yourself. ▷ I had to look it up, because I didn’t know. It’s the feminine form of the Latin Carolus, which is a cognate of Charles, and means full-grown, freeman. ▷ Pop. I like Beyoncé a lot. ▷ It was a Brazilian country duet called Jorge & Matheus, in São José do Rio Preto, SP, Brazil. I got voiceless after the concert. ▷ I like “Ironic“, by Alanis Morissette. ▷ The Pursuit of Happiness. ▷ When I was younger, I loved Leonardo Di Caprio. I had posters of him all over my bedroom and a folder with pictures and news about him. Nowadays I do like him, but as an actor. It’s not a crush anymore. ▷ Alice, from Alice’s Adventures in Wonderland. ▷ Not a big fan, but I liked watching Mamma Mia. ▷ Marta Stelmaszak and Valeria Aliperta. ▷ Determined, stubborn and grumpy. ▷ I am truly proud of my business, Alberoni Translations. ▷ Believe in yourself and go for it. ▷ Yes, “wanderlust” on my ribs, just below my left arm. It means “strong desire to travel”. ▷ A notebook and a pen to write about my experience and feelings; and sunscreen. ▷ Bel Pesce, a Brazilian young entrepreneur. ▷ I would love to exchange some ideas with her and talk about entrepreneurship in general. Awww! I didn’t know Bel Pesce. It’s always good to have great professionals as models. You can follow in their footsteps and draw inspiration from them. You are a great ladypreneur, and you built your own business. That’s a great thing! I can see your constructive attitude and feel the positive energy coming from your soul. Keep going and good luck with anything you would like to create from now on! Thank you so much for taking part in the series! I hope that we could talk soon again, it would be a pleasure to have you here again.  Oh, and I’m sure our readers would love it, too. Who’s Caroline? ▷ Caroline is a Brazilian freelance translator. She translates IT materials from English and Italian into Brazilian Portuguese. Caroline is the head and heart behind Alberoni Translations. 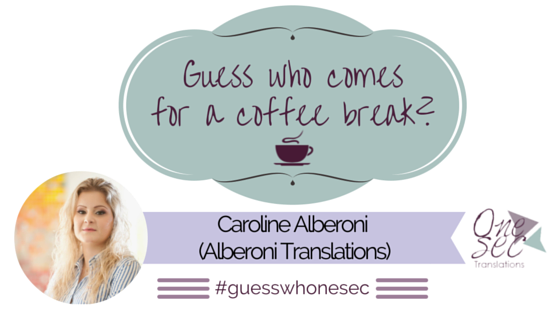 She has a blog “Carol’s Adventures in Translation“, and can be found on Google+, Twitter, Facebook, LinkedIn, Pinterest, Instagram (@alberoni), Snapchat (@calberoni) and Periscope (@Alberoni). I learned about Bel Pesce recently as well, and now I’m a stalker. She’s young, but incredibly amazing, intelligent and professional. I learned about her from a Brazilian runner I follow. She said something like this: people spend most of their times complaining about everything and everyone, but some people, like Bel Pesce, don’t find the time to do so, because they are always busy creating something new and innovating. I found it fantastic! And it’s totally true. Thank you for the hint about Bel Pesce. I totally agree with this kind of vision. You know, I’m an always-positive-mindset supporter, so I think the more we are proactive and creative the more we can get out of life. <3 I'm definitely going to follow her.